At last, at last, at last!!! Since I graduated from high school, I've been selling and/or giving out copies of a CD that I recorded that summer before college. I was never 100% happy with it, and always yearned for the time/$$$ to record a new one that I could really be proud of. 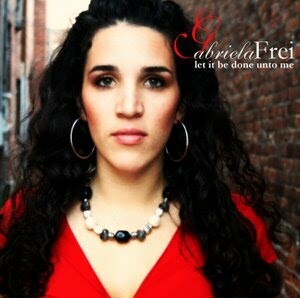 With new and improved recordings of Fiat, Let Me Live, Transfigure, and other favorites, I present to you my new CD: Let It Be Done Unto Me. I am so proud of this new CD. My wonderful husband Jonathan got me a terrific digital piano for my birthday/Christmas this past year, and is it ever awesome! It's a Kawai ES1, and I couldn't be happier with it. Best of all, I can hook it up to my computer, along with a microphone, and voila: a new CD recorded in under a week, just in time for the Women of Faith, Women of Action conference. At which I sold a LOT of CDs! If you would like to order a copy of this new CD, sample the songs here on my website, then contact me and I'll be happy to get you a copy.